Design by Steve Trumbull, graphic by Rick Bickhart. 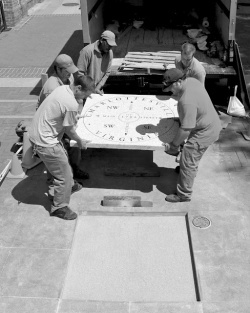 The Medallion at First & Main is a granite paver that was installed on the Downtown Mall on April 25, 2012. The Charlottesville graphic design firm Gropen Design, which specializes in architectural signage, was hired for the project. 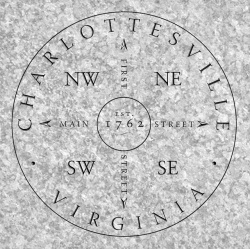 "This is a gift to the City of Charlottesville from me and generous contributors who as a group represent local business, area real estate, deep family roots in Charlottesville, volunteerism at its best, and a connection to place. I am very grateful for their support of this project." 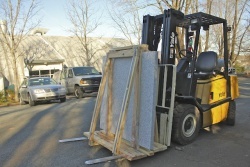 The granite stone paver that became the Medallion at First and Main arrived in Charlottesville from Mt Airy, North Carolina, on March 2, 2012. The granite quarry in Mt Airy is one of the largest in the world and has been in operation since the 1880s. The stone for the medallion was formed in the Devonian Period, roughly 400 million years ago. Measuring 4 x 4 feet and nearly 3 inches thick, the stone is made up of feldspar (white), quartz (grey) and biotite mica (black). 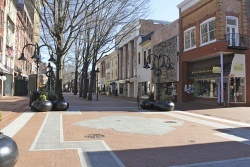 Charlottesville's Board of Architectural Review, approved the granite medallion to be installed at First and Main Streets on January 17, 2012. ↑ Web. Charlottesville Then and Now, Steve Trumbull, January 20, 2012, retrieved January 27, 2012. ↑ Web. Charlottesville Then and Now, Steve Trumbull, January 5, 2012, retrieved January 27, 2012. ↑ Web. City moves to accept 'center of town' marker, Daily Progress, World Media Enterprises, January 4, 2012, retrieved March 9, 2012. This page was last edited on 9 May 2012, at 16:11.